There's nothing more I like than a nice hot cup of coffee with cream in the morning. As a matter of fact my day doesn't begin until I've had that first cup of joe. Don't even think of speaking to me before then because "it's not going to happen!". If you enjoy coffee as much as I do, or have a family member or friend who enjoys their coffee, then this post is for you. This post was sponsored by KING'S HAWAIIAN as part of an Influencer Activation for Influence Central and all opinions expressed in my post are my own. There are lots of reasons why I enjoy that cup of coffee, one of them being that coffee makes me happy. Traveling also makes me happy. 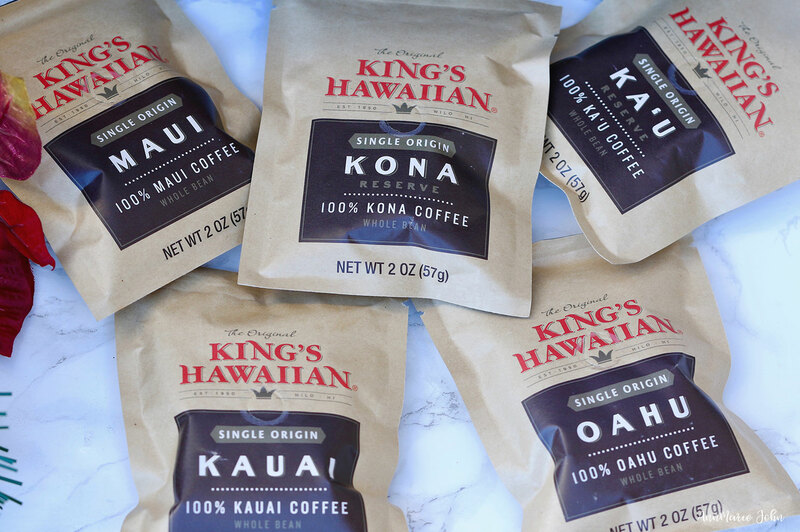 So when I heard that my favorite sweet rolls company KING'S HAWAIIAN was introducing a Single Origin Coffee line, from a place that's been on my bucket list for ages, the Aloha State, I just knew that I had to give it a try. Every morning I would have my coffee with a sweet roll while dreaming of the islands. As an island girl, there's nothing more relaxing than a dip in the ocean, with a nice gentle breeze blowing, but I digress. The Hawaiian Islands is known to grow some of the finest coffee beans in the world, and everyone loves having the best. 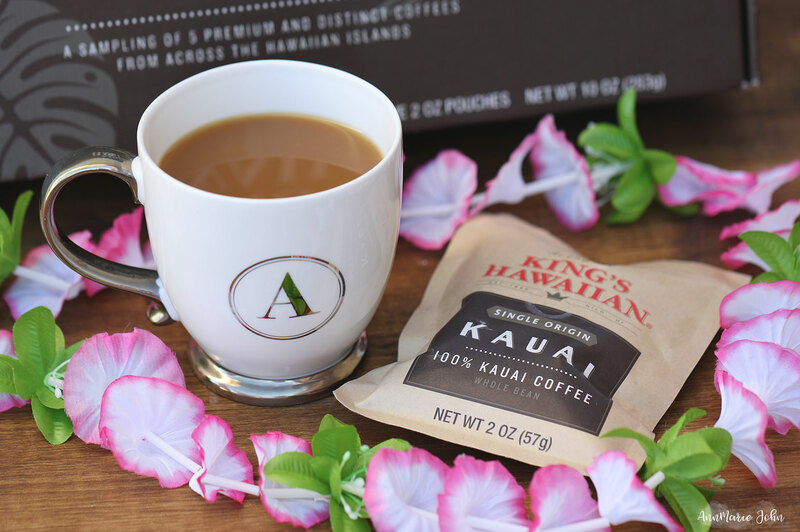 The KING'S HAWAIIAN Single Origin Coffee Gift Set - Whole Bean is the perfect gift for the coffee connoisseur in your life. You know that one who just have to have their coffee, but is picky about the taste? The one who loves savoring every drop? But what exactly is Single Origin Coffee? Single Origin coffee comes from one region and is NOT a blend. It's coffee that is made to invoke the flavors of the regions that it comes from, and is usually served at higher end coffee shops. However, you can now have it in the comfort of your own home. 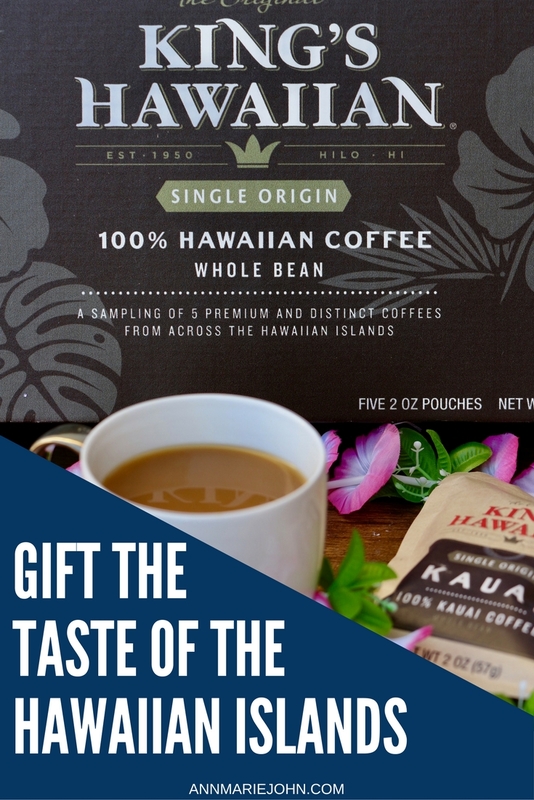 KING'S HAWAIIAN Single Origin Coffee Gift Set comes ready for gifting, complete with 5 2oz pouches of delicious goodness from a different region of Hawaii; Kona, Ka'u, Maui, Kauai and Oahu. The 2oz pouches is a great way to sample the flavors before purchasing the full sized product. It also gives you the chance to see which flavor is your favorite. Personally I prefer the light roast flavor of Ka'u with it's citrus undertones. It's totally OK to be a coffee snob. You can certainly taste the difference between these premium coffee beans, compared to your regular coffee that you may currently be drinking. 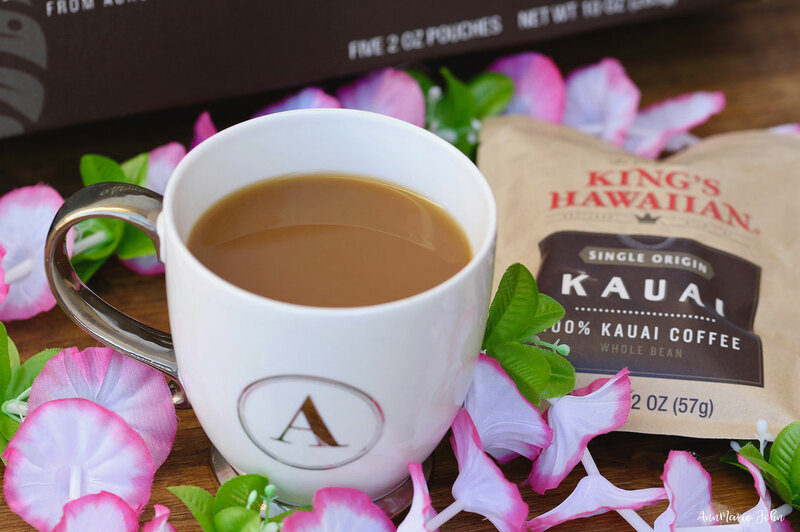 When you buy KING'S HAWAIIAN Single Origin premium coffee beans, you get to experience the freshest coffee that will not only delight but excite your taste buds. 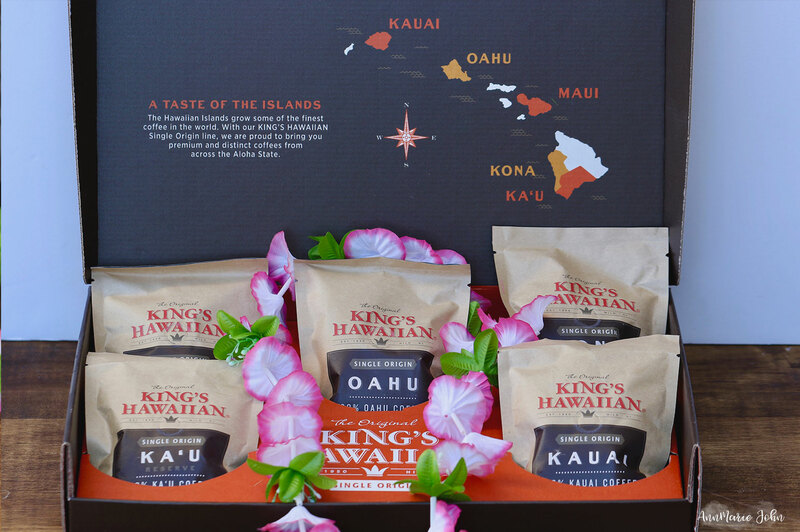 Give the taste of the Hawaiian Islands, and the gift of coffee this holiday. Give your friends something to talk about with this beautiful assortment of Hawaii's premium coffees. Shop this KING'S HAWAIIAN gift set NOW and save 20% off your purchase by using promo code: PSCGS1720. I didn't know Kings Hawaiian had coffee! I must try because we love their rolls! I am a major coffee addict, so I am not sure how I haven't tried this yet, but I have to. It sounds like delicious coffee. My Hubby is a huge Coffee lover. This would make an excellent gift for him. Thanks for sharing this. That coffee looks so good but I never see Hawaiian coffee in the stores here in NY. It really seems like a special coffee and a great gift for the holidays for something special that we all love. This coffee sounds absolutely delicious! I'd love to try a cup! I've never been to Hawaii but I dream of the day I get to visit the islands! I didn't know King's Hawaiian made coffee! I love their rolls. Now I have to see if I can find this. Sounds like a great coffee! I have heard of this coffee before but never tried it. It sounds delicious and I can't wait to hunt it down. While I love Hawaii I hate coffee with a passion. I've never managed to stomach the smell of it. Even coffee flavored or scented items. I might suggest this to my coffee loving friends though, heaven knows I have enough of those! lol! I'm not a coffee drinker thought sometimes I wish I was. I've heard great things about Hawaiian coffee. This would definitely make a great gift for the coffee lovers in life. Oh gosh this would be a perfect gift to give my father-in-law. He is a huge coffee fan and I never have coffee in the house. So when he comes to visit I like to find unique types to have him to! I'll have to add this to my list! I love how this comes in such a cute set! My mother-in-law would love this for Christmas. Thanks for this recommendation. Oooo that coffee sounds great, I'm a coffee monster! I'd love to taste this one! This is my kind of gift. I love the bold rich flavor of coffees I've tried from Hawaii. I would love this as a gift. I think there are a lot of us coffee lovers out there. So this is a great one to get because you'll definitely find someone to give this to. I would be the happiest gal with this is as gift!! I love kona coffee. I had no idea that King's Hawaiian made coffee. I need a drink that takes me to Hawaii! I know this is a great coffee. I am sure my family would love it. I had no idea King's Hawaiian had a coffee line. I bet my husband would love this. My kids love their bread. I drink coffee every day and have to try this! I've never tried Kona coffee before! How did I miss the memo about King's Hawaiian coffee??? I loved all things King's Hawaiian when we lived on Oahu! I need to find this asap! If you can't go to Hawaii, the next best thing is coffee from Hawaii. What a great idea for a gift! I LOVE coffee- and this sounds delicious! I’m a huge coffee fanatic! I would love to try this one out some time! Yum! That IS a gift. My ex used to tell me about the Kona coffee in Hawaii. The stuff of dreams!! I'm glad I can still have that glorious taste here. You had me at coffee! I live on coffee now that I am a busy mom! I'm going to have to check this brand out! It's been years since I've been to Hawaii but I certainly remember the delicious coffee there. This is an awesome gift idea. I love coffee!!! This one sounds like one that I have to try out soon! My wife is a coffee lover and I'm sure she will love this one.